Residents from New York and New Jersey gathered on October 11 for the New York Academy of Medicine’s (NYAM) Anesthesiology Residents’ Night. Twenty-two participants presented their research to a panel of judges. Weill Cornell Medicine's Dr. Robert White, a resident in the class of 2018, won first place for his oral presentation “Readmission rates and diagnoses following total hip replacement in relationship to insurance payer status, race, and income status." Co-authors are Daniel Sastow, Licia Gaber-Baylis, Virgina Tangel, Andrew D. Fisher and Dr. Zachary A. Turnbull. The research, which looked at hospital readmission rates following total hip replacement surgery, found that a patient's race, income and insurance status impacts his or her odds of readmission. Dr. White’s research is part of a multi-project effort by Weill Cornell Medicine’s Center for Perioperative Outcomes (CPO), designed to investigate causes and methods for addressing healthcare disparities in surgical and anesthesia patients. The project is supervised by Dr. Zachary Turnbull, director of the CPO and medical director of performance improvement; Dr. Robert White, who is also a Van Poznak Research Scholar; and Anna Nachamie, operations administrator for the CPO. 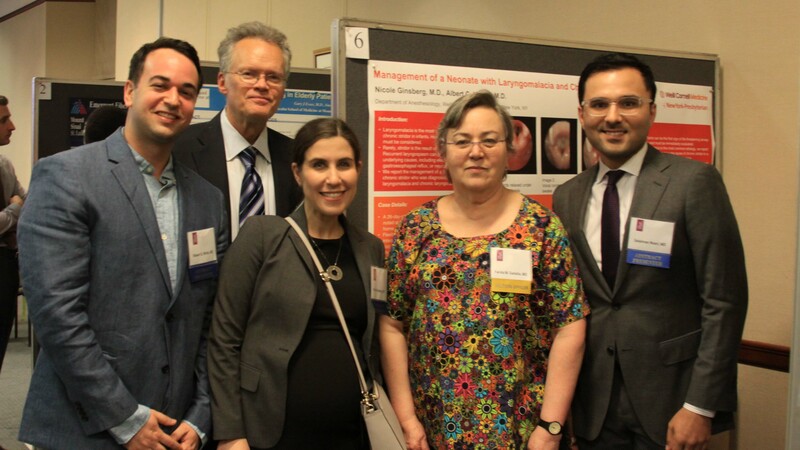 Also participating in the NYAM event were Dr. Nicole Ginsberg, a CA-3 resident, who presented her poster, "Management of a Neonate with Laryngomalacia and Chronic Laryngospasm" and Dr. Selaiman Noori, a CA-3 resident, who presented his poster, "Medically Refractory Central Post-Stroke Pain Treated with High-Frequency Spinal Cord Stimulation at 10-kHz." Dr. Jon D. Samuels, assistant professor of clinical anesthesiology, served as one of the evening's judges. Dr. Farida Gadalla, professor of clinical anesthesiology, is co-chair of the NYAM's section on anesthesiology. Established in 1847, the New York Academy of Medicine is a private, independent organization that addresses the health challenges facing New York City and the world’s growing urban populations.